This page is under construction. More Q’s & A’s to come. What are the Tar Sands? The “Tar Sands” (or if you are a business executive, “unconventional or heavy oil”) are naturally occurring deposits of petroleum, sand and clay mixed up to make an asphalt-like substance technically known as bitumen. For much of the 20th century, these deposits were largely ignored by oil companies as a source of petroleum due to the comparably inefficient process used to turn bitumen-in-the-ground into gasoline-in-the-tank, if you will. Now, because of dwindling production of conventional petroleum sources since the cresting of Hubbert’s predicted peak oil scenario, every major oil company in the world is now investing in tar sand extraction. Where are the Tar Sands? Bitumen deposits can be found all over the world, however most of these are too small or inaccessible to make development of these sites feasible. The only deposits currently under commercial development are in Venezuela’s Orinoco Basin, and Alberta, Canada’s taiga forest. The oil industries operations in the Alberta Tar Sands constitute about 90% on the world’s “unconventional oil” industry. The Alberta bitumen deposits stretch across an area roughly the size of Florida and are speculated to contain the world’s second largest (measured by recoverable barrels of oil) deposit of oil after the Saudi Arabian oil fields. Some studies suggest the Alberta Tar Sands are in fact the largest deposit. Recently, plans have been submitted to begin extracting oil from tar sands in eastern Utah, as well. The tar sand boom in Alberta has been called the largest, most destructive industrial operation on the planet, ever. At a time when a changing climate and dwindling biodiversity across the globe threaten to drastically alter our way of life, at best, or wipe out all life on Earth, at worst, expansion of the tar sand industry is a step in the wrong direction if we are to develop a sustainable human existence. Tar sand mining irreversibly destroys landscapes, threatens the health of whole watersheds, negatively affects human communities, and accelerates climate change through greenhouse gas emissions and deforestation. What impact does the tar sands have on the land? The tar sand mines of Alberta are the site of the second fastest rate of deforestation in the world, behind the slashing on the Amazon Rainforest. Bitumen is located deep underground and is too thick to be pumped to the surface by traditional means. Oil companies have learned that it is most profitable to dig the bitumen up using strip-mining techniques, such as those used in the coal industry’s mountain top removal mines. Vast expanses of pristine, old-growth taiga (aka boreal) forest are clear-cut. The timber is sold, pulped, burned or otherwise disposed of, along with several meters of peat moss (which any home-gardener can tell you is the richest, and rarest, soil-type there is) and every other living thing in the forest. Unlike regular logging operations, the clear-cutting that occurs before tar sand mining fails to offer even the most cynically token chance of forest recovery. This is because after the forest-scape is removed, the top layer of earth (referred to in the industry as “overburden”) is dug up and hauled away. This surface removal often reaches depths of several hundred feet. Only now is the bitumen accessible and promptly removed, leaving a lifeless moonscape where once there was a lush green wilderness. What impact does the tar sands have on the water? Tar sand operations use extraordinary volumes of water. Certain types of bitumen extraction (known as “in-situ”) require great quantities of superheated water to be pumped deep underground to essentially melt the tar into a viscous enough substance to pump it to the surface. Bitumen, being too thick to flow naturally through transport pipelines, is diluted at giant facilities near the mines in preparation for pumping to distant refineries. This process, called “upgrading”, results in this localized cluster of tar sand facilities using as much water as the city of Calgary (population ~2 million). The primary source of water for these processes is the Athabasca River. The Athabasca, a glacier fed river which feeds giant Lake Athabaska 765 miles downstream (this subsequently flows into the Mackenzie River system and, eventually, the Arctic Ocean). The tar sands sit approximately halfway, and this is the point at which great impact occurs. For every barrel of oil produced at the mines, ten barrels are sucked out of the Athabasca, up to half of which becomes so oily and toxic that it can never be excusably returned to the river. This oil-water is stockpiled behind some of the world’s largest dams (built from the overburden of the strip-mining process) to “settle,” or separate… an unproven process which even at best is expected to take several decades to complete, if ever. Meanwhile these toxic ponds grow to such vast size that they are visible from space. Despite oil companies’ claim to the contrary, environmental reports state that more than five million gallons of this waste-water leaks out of the ponds and back into the river or groundwater annually. In communities downstream that have seen spikes in environmental red-flags such as mutations in wildlife and rare cancers among humans, the once pure Athabasca River is now considered poisonous and off-limits to drinking. Wildlife near the tailings ponds face their own risks when mistakenly treating the ponds as hospitable, such as the 10,000 estimated waterfowl that die each year when coming into contact with the water’s surface. One such incident included between 500-1200 migrating ducks which died together when the flock landed on the pond. What impact does the tar sands have on the atmosphere? Since signing on to the international Kyoto Protocol treaty, Canada has failed miserably at upholding its part of the agreement. One of the top ten greenhouse gas (GHG) emitting countries, per capita, in the world, Canada hosts the single greatest point-of-origin for carbon emissions on the planet. While home to only 11% of the country’s population, Alberta contributes over 40% of the country’s GHGs. This is also worsened by the fact that those emissions are coming from barren expanses of land once covered by the boreal forest which served as one of the greatest storehouses of carbon on the planet. An estimated 40 million equivalent tons of CO2 were emitted from tar sand facilities in 2007, and this is estimated to have doubled by next year (2011). Meanwhile, 8.7 million tons of stored carbon is also released each year through tar sand related deforestation. What is the Kearl Module Transport Project (KMTP)? The KMT is a requested project by ExxonMobile to transport large pieces of mining and refining equipment from factories in South Korea to the tar sand operations in Alberta, Canada. The equipment will travel by sea to the Port of Vancouver, Washington where it will be transferred onto barges. The barges will carry the loads up the Columbia and Snake rivers to the Port of Lewiston, Idaho. In Lewiston the “modules” (as the cargo is being called by Exxon) will be transferred to truck-trailers for their final journey overland. These trucks will move their loads across northern Idaho and western Montana on their way to Alberta. The application for the J-32 “oversize load” permits required for this project was submitted by Imperial Oil, a Canadian oil company 2/3rds owned by Dallas, TX based ExxonMobil. That truck looks pretty big. Is that what we can expect to see here too? Yes! The specifications provided by Exxon claim that the loads will be up to 24 feet wide, 30 feet tall and 163 feet long. However this length measurement does not include any additional “push trucks” added on for extra power in the mountains. Overall these trucks will total over 200 feet. Put another way, these loads are two lanes wide, 3 stories tall and more than 2/3rds the length of a football field. The combined weight would be up to 580,000 pounds (about equal to 10 freight train locomotives). These loads will be moved in a caravan of vehicles. In addition to the main truck, the caravan will also include at least two escorts by the highway patrol and an unknown number of support and backup vehicles from both the trucking company and state transportation departments. That's a logging truck on the right. 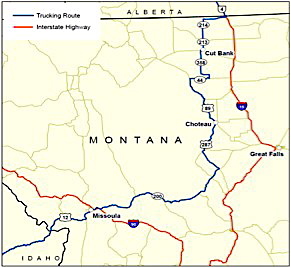 The proposed route through the northern Rockies follows US 12 across Idaho, along the Clearwater and Lochsa rivers, over Lolo pass to Lolo, MT; then north on US 93 and Reserve St, through Missoula to I-90. The trucks leave I-90 soon after in Bonner and continue east on state highway 200, along the Blackfoot river and over Rogers pass. The trucks continue to follow the front range north through Choteau and Cut Bank to the Port of Sweet Grass on the Montana-Alberta border. More answers still to come….